It has been almost five years since the City of Riverside closed Dufferin Avenue at McAllister, cutting off a “critical circulation and emergency access link for the communities of The Orchard, Victoria Grove and other developments located east of La Sierra Avenue, and north of El Sobrante”. I sent a few emails last week to contacts within the County of Riverside to find out the construction status of “A” Street (Fairway Drive), since the last estimate I received was that construction might start this summer. One person told me that there is no firm timetable, and that staff is continuing negotiations to purchase the properties needed for the right-of-way (one of six has been purchased). Another person told me that the County is working with the developer, but that there is hope construction will begin by the fall. Unless you devote many hours to attending County meetings (I don’t), construction projects can be difficult to follow. This post contains information on the construction of “A” Street from my review of County documents. If you find that I have missed something, relied on outdated documents or have any feedback, please leave a comment below. Also, if you would like to express your support for this project, it falls within Supervisor Kevin Jeffries‘ district. The quoted words in the first sentence of this post aren’t mine (although I agree with them). They are from a submittal dated 01/15/14 from the Riverside County Transportation Department to the Riverside County Board of Supervisors recommending approval to enter into right of way and temporary construction agreements with CV Inland Communities 1, LP. The Board approved these recommendations on 02/04/14. CV is the developer that is building the Citrus Heights community. From what I can tell, the Citrus Heights plan calls for the construction of 345 homes (no golf course) between McAllister and Van Buren (see the end of this post for info on Citrus Heights). The Riverside County Transportation Department (RCTD) proposes to construct A Street, a two-lane collector road connecting McAllister Street to Van Buren Boulevard in the Woodcrest area (Project). Approximately 40 percent of the Project is located in the unincorporated county area (County) and 60 percent is located within the City of Riverside (City) jurisdiction. In 2006, the County approved Tract 30153 (McAllister Hills), which would have constructed a golf course residential community development. 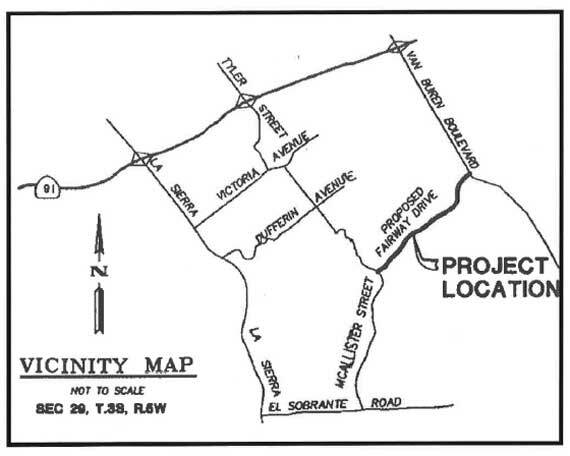 The County required this tract to construct a new road between McAllister and Van Buren, referred to as A Street, which would serve traffic from the development and provide an alternate access route for residents of Victoria Grove, the Orchards, and other communities in the area north of Cajalco and east of La Sierra. In 200B, work ceased on the developer’s project, which went into foreclosure due to the economic downturn. Since that time, the communities desire to see “A” Street move forward has been heightened by the closure of the extension of McAllister north into the City of Riverside. The County took over the “A” Street project in 2010 and is working on property acquisition to prepare for construction. Funding for the acquisition comes from Development Impact fees collected in this area since this road will help mitigate impacts of future development. Environmental Impact Report No. 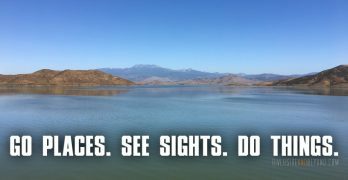 433 (EIR) was completed in compliance with the EIR Guidelines and Riverside County Rules to implement California Environmental Quality Act (CEQA). On December 21, 2004, the Board of Supervisors adopted Resolution No. 2004-539, Certifying Environmental Impact Report No. 433. On September 24, 2013, Amendment No.1 to EIR No. 433 was approved by the Board of Supervisors. CV Inland Communities 1, LP, a Delaware limited partnership (CV Communities) has agreed to dedicate the right-of-way and temporary access from the portion of the property needed for the proposed A Street project at no cost. […] There are costs of $16,200 associated with this transaction. The Board’s approval of these agreements follow the earlier approval of an agreement (link is to the first amendment) that calls for the developer to contribute $1.6 million toward the construction of Street “A” after certain conditions are met. The Amendment of SP 325 and its associated tracts is coming before the Board for consideration as a separate Item on this same agenda. A necessary infrastructure component of this project is “A” Street, a new road that will extend from McAllister Parkway to Van Buren Boulevard. “A” Street is not only necessary for this project but also a critical circulation and emergency access link for the communities of The Orchard, Victoria Grove and other developments located East of La Sierra Avenue, and North of El Sobrante. The” A” Street Project is approximately 40% within County jurisdiction and 60% within the City of Riverside jurisdiction. 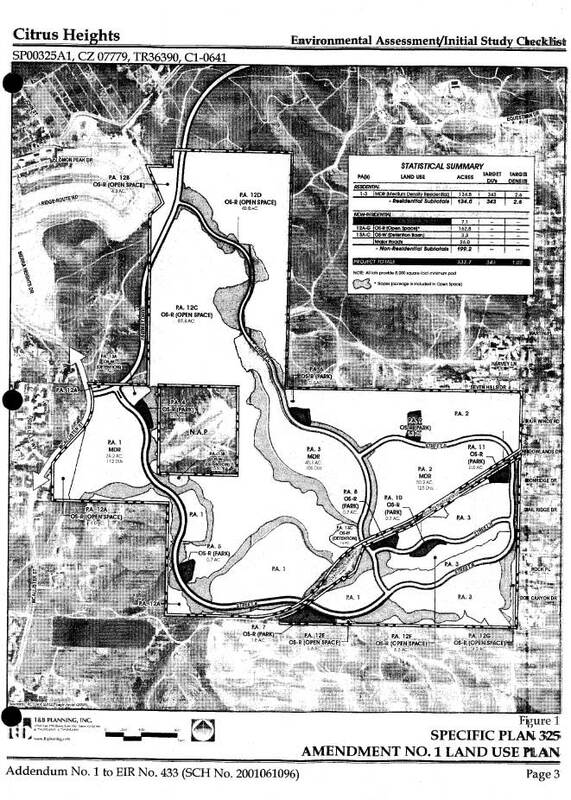 On October 16, 2012 the Board entered into an agreement with CV Communities, the Developer of this project, whereby the Developer will provide the County with $1,200,000 in funding towards the construction of the road upon County approval of the entitlements, and another $400,000 within 6 months of the County awarding a construction contract. This Amendment accelerates the payment of the $400,000 and provides a vehicle for the Developer to contribute additional funding, in exchange for additional DIF credits, and also a mechanism for the Developer to receive DIF credits if they have to construct the road project. This amendment therefore helps facilitate the construction of “A” Street. The County is in the process of acquiring the needed right-of-way for “A” Street, and working with the City of Riverside on a funding plan for the construction phase of the project. 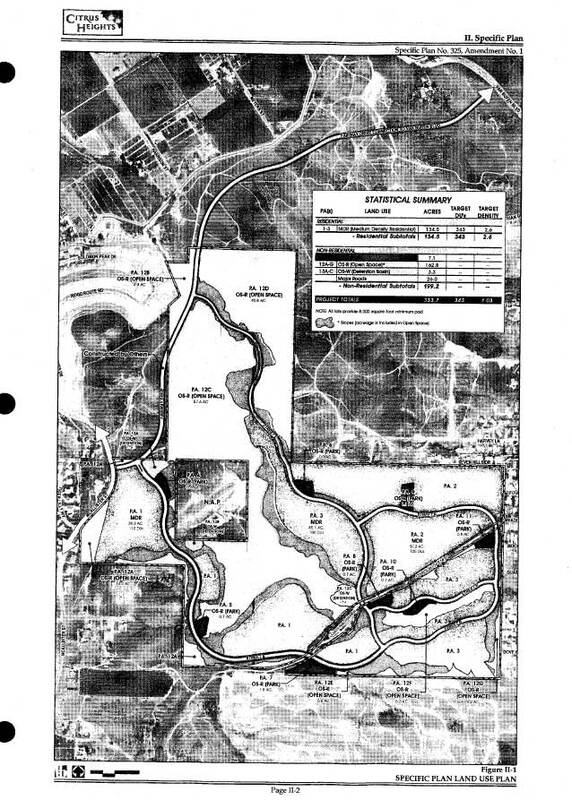 The best document I have found about the Citrus Heights project is here (emphasis added). No. 433 – Applicant: CV Communities, LLC – Engineer/Representative: T&B Planning – First/First Supervisorial District – Lake Mathews Zoning District – Lake Mathews / Woodcrest Area Plan: Community Development: Low Density Residential (CD: LDR) (1/2 Acre Minimum), Open Space: Conservation (OS: C), Rural Community: Very Low Density Residential (RC: VLDR) (1 Acre Minimum), Rural: Rural Mountainous (R: RM) (10 Acre Minimum), El Sobrante Policy Area – Location: Southerly of Van Buren Boulevard and easterly of McAllister Street – 333.7 Gross Acres – Zoning: Specific Plan (SP00325) – REQUEST: The Specific Plan Amendment proposes to increase residential acreage from 98.4 acres to 135.5 acres, increase the total number of residential units from 295 to 345, increase the average residential lot size from approximately 10,237 square feet to approximately 12,976 square feet, increase the development intensity from 0.9 to 1.0 dwelling units per acre (du/ac), eliminate the 119.1-acre golf course and 3.5-acre golf course clubhouse land uses from the Land Use Plan, increase the area reserved for open space from 85.2 acres to 162.4 acres, increase the acreage designated for public parks from three parks on 2.5 acres to eight parks on 7.0 acres, provide approximately 6.6 miles of pedestrian trails and modify the internal circulation system to accommodate the modified land use plan. The Change of Zone proposes to modify the adopted Specific Plan Zoning Ordinance for SP325 and formalize all of the planning area boundaries within the Specific Plan. The Tentative Map is a Schedule A subdivision that would subdivide 333.7 acres into 343 single-family residential lots, 8 park lots, 3 water quality detention basin lots, and 43 open space lots. Do you live in the area? I gre up on McAllister, just one of three homes and when they made that stupid decision to close off both McAalister and Dufferin it impacted my family in fuel cost, time on the road and we had an emergency and we saw the ambulance going down Dufferin, then it had to come all the way around back to my parents home. We are fortunate we didn’t lose my dad in those crucial minutes! @Carrie – Yes, the Dufferin closure affects us too. We make almost daily trips to the Woodcrest area, which means we now have to drive around to Victoria to get to Van Buren. Glad your father was ok.
Is this website still being updated? It’s almost March 2015 and the hills are graded, roads are being formed. Yes, it is still being updated. This is an older post. Here is the latest post: http://www.riversideandbeyond.com/a-street-dufferin-update-jan-15-public-hearing-on-011315/.